Have a holiday so jolly that it’ll make Santa jealous, with our Christmas guide to festive events and activities in London. Christmas at Kew Gardens is a magical world. Whatever your age you will feel transported into a genuine fairy-tale. Once the sun sets, enchantment starts with a sparkling festive trail of lights. As the Palm House leaps into life with a dazzling show of laser beams, jets of light and kaleidoscopic projections, you enter a fantasy world of singing trees, outsize flora, luminescent ribbons, giant baubles and a flickering Fire Garden. Christmas entertainment is provided by Santa and his Elves at the North Pole village. You can warm up with your little ones and enjoy hot chocolate and toasted marshmallows around the fire. Or have some fun on a vintage fairground ride. Christmas at Kew is open 5–10pm; choose your time slot for entry (last entry 7.40pm). Click here to visit the Kew Gardens website. The beautiful Somerset House ice skating rink is famous both for its magical winter atmosphere and its energetic programme, day or night. This year Skate Lates have been added to the schedule, which make for a perfect evening’s action, where you can enjoy a specially curated programme of music nights throughout the season – the perfect start to your weekend. Fortnum & Mason are the main feel good partners at the Ice Rink. At Fortnum’s Lodge the treats on offer include Mulled Wine & Sharing Mince Pie with Clotted Cream, Chocolate Fondue & Champagne, Wine & Cheese Fondue or a Champagne & Smoked Salmon Platter. By night, the kitchen closes, and the bar serves up spirits and cocktails alongside festive perennials Champagne, Mulled Wine and a very tipsy-making take on Hot Chocolate. Over the Christmas and New Year holidays, the seasonal variations apply to the opening times of the ice rink, Fortnum’s Lodge and Fortnum’s Christmas Arcade so be sure to check before your visit. Click here to visit the Somerset House website. Would Christmas really be as festive without an indulgent overload of sugary goods? The ballet’s candied cornucopia of sugar-frosted fancies makes it the sweetest work in the repertory of the ROH. E.T.A Hoffman’s The Nutcracker and the Mouse King tells the enchanting story of a young girl adventures in a wonderful Christmas world, a tribute to the traditional marzipan makers of Nurnberg. The Royal Opera House Orchestra plays Tchaikovsky’s magnificent score as the protagonists travel along a path of nougat by a lemonade river that winds past glistening Bonbonville, crossing Rosewater Lake to reach the capital Confiturembourg topped by the Marzipan Castle. The choreography is by Peter Wright after Lev Ivanov, and it is sure to enchant dreamers of all ages, making it a must for the winter holidays. Click here to visit the ROH website. 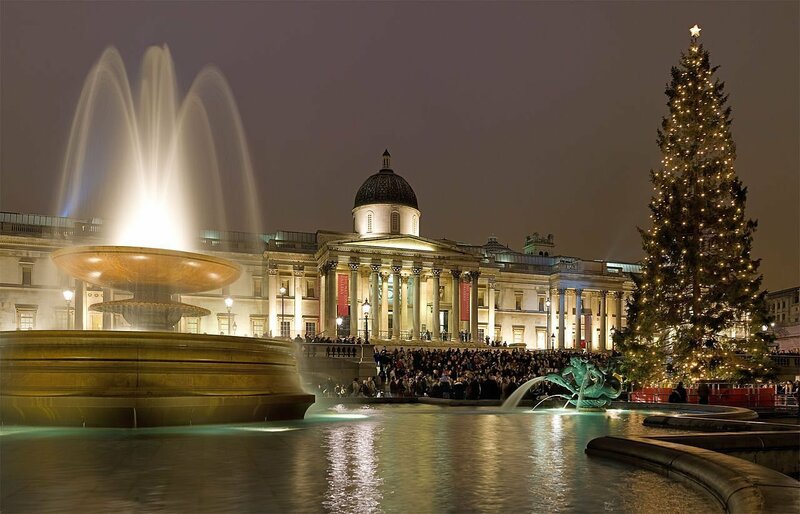 Belgravia’s leading design district will host a Christmas celebration on 3rd December in the popular Orange Square. The area, well known for its Farmer’s Market and for Pimlico Road, is London’s premier destination for interior design, art, antiques and fine furniture. Belgravia is transformed into a winter wonderland with Christmas lights and festive window displays. The community organises treasure hunts for children and their parents alike. Bring the family and enjoy live music, Christmas entertainment and warming treats in Orange Square. Shop for your Christmas gifts on Pimlico Road and find your favourite stocking fillers on market stalls in Orange Square, hours extended for the Christmas celebration. Click here to visit the Visit London website for more information on the market. Belgravia retailers are taking part in a Christmas window display celebration. There are awards up for grabs for the most creative, glamourous and festive Christmas windows. Take part and vote for the Fans’ Favourite Award by simply uploading an image of your own favourite window to Instagram, Facebook or Twitter using the hashtag #BelgraviaChristmasWindows. You will have the chance to win a unique Belgravia prize, so get down to Elizabeth Street, Motcomb Street and Pimlico Road and start snapping!